January 21, 2009 by tricia royal in fashion musing, this inspires me! 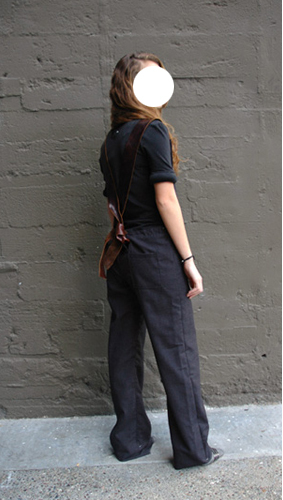 these surprisingly sophisticated overalls are from san francisco's own harputs market, purveyors of their own small collection of clothing (to which said overalls belong) and avant guarde labels like maison martin margiela and pleasure principle. p.s. i found out about the shop via garbage dress, the intriguing blog of an intriguing gal, zana, who works there. i am delighting in her obsessions and insights and doings...though the life she stylishly leads and the objects over which she obsesses are not anything like my own. which makes her and all of it all the more interesting to me. anyone else like this? inspired and moved by those NOT like you, not just those like you?